Petite: Choose hats with a low profile crown and a small brim. Avoid big hats which can overpower you. Many cloche style hats are particularly flattering on a petite frame. Tall: Hats with a wide brim and a shorter crown are most flattering. Stay away from narrow and angularshaped hats. Full Figured: Full brimmed hats that are wide can help balance your shape. Adjusting a hat: If a hat isn't flattering when you first try it on, you may need to adjust how it is placed on your head. You may not be wearing it far enough forward or back. The hat should be angled to its best advantage. Try tilting it slightly to the right or to the left. Angle it from every direction and view it from every angle. Experiment until you find the optimal look. Glasses: If you have glasses, try upturning the brim of your hat for a more flattering look. Hair: If you have hair, try tucking your hair behind your ear or putting your hair up for the best look. Earrings: Experiment with different earrings to add interest. For women with hair loss,large statement earringscan help balance your look and focus attention back to your face. Get crafty: Adornments from your craft store can be used to personalize your hat. The possibilities are endless. Hairpieces: For women with hair loss, we offer velcro bangs and a wide variety of hairpieces with open tops that can be worn underneath your hat. They add the appearance of hair without having to wear a full wig. Visit our hats with hair page for more details. Picking out hats can be overwhelming, especially on a tight budget. You might think you have to break the bank, buying enough hats to match your outfits and suit your style. Luckily, this is not the case. With the help of accessories, you can turn one hat into hundreds. 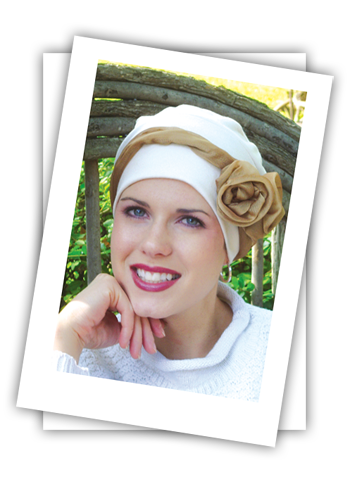 Our Three Seam Turban is an excellent choice for accessorizing. It is shown here with our Rosette Scarf Twist. Style: Choose a hat that is simple and casual to maximize accessorizing options. Color: Try to select a hat in a neutral color, or a color that matches many of your outfits. You can add a punch of color with various accessories. Comfort: Choose a soft and breathable fabric suitable for daily use. Recommendations: We recommend our Cozy Caps, our Three Seam Turbans, and our Denim Bucket Hat for starters. These are basic neutrals that can achieve many different looks. Placing an elastic headband around the brim of your hat can completely change its effect. For example, a beaded headband can turn your casual cozy cap into a chic statement piece. A wide variety of headbands are available to suit every style, from hippy to Hepburn. Headbands can be purchased at many retailers, including Headcovers, or if you're crafty you can make your own. Clipping a pendant or broach to your hat can add heaps of visual appeal. Headcovers sells various beautiful floral pins to decorate your hat. If you're festive, you can purchase or make pendants that suit the season, such as snowflakes or pumpkins. Tie a head scarf at the base of the cap to add a pop of character. Our rectangular accessory scarf and our mini scarf are ideal for achieving many beautiful looks. With three mini scarves, you can create a braid. With two mini scarves, you can create a twist. For more variety, tie the scarf in a bow or a rosette. Mirror Method: Stand in front of a mirror and pull your hair back. With a bar of soap or lipstick, trace the outline of your face onto the mirror. Compare the outlined shape on the mirror to the pictures below. Tracing Method: Trace the outline of your face from a photograph. Observe to see what shape is revealed. Measure across the tops of your cheekbones. Measure across your jaw line from the widest point to the widest point. Measure from the tip of your hairline to the bottom of your chin. Compare measurements to the guide below. Description: When you measured your face, your length was equal to about one and a half times width. Your face is only slightly narrower at the jaw line than at the temples, with a gently rounded hairline. Best Choices: Because of your face is balanced and in even proportion, you can wear almost any style. Avoid: The crown of the hat should never be narrower than your cheekbones. Hats should be no wider than the width of your shoulders. Description: Your face is approximately twiceas wide as it is long. You have a round chin and a round hairline. The widest point is at the cheeks and ears. Best Choices: Styles that addfullness and height at the crown. Select hats with sharp lines, tall crowns, high brims and asymetrical shapes. Straight brims should be slanted to create flattering angles. Wear your brims on an angle whenever possible. The crown of the hat should be at least as wide as your face. A hat with a higher brim will help lengthen your face. Avoid: Rounded crowns, circular or floppy-shaped hats. Description: When you measured your face, it was narrow at the jaw line and wide at the cheekbones and/or forehead. Your face appears wide at the temples and hairline and narrows to a small, delicate chin. Best Choices: Medium brimmed hats are ideal because they do not accentuate a wider forehead or a narrow chin. Heart shaped faces look good in almost any hat style. Hats with asymetrical brims are a good choice. When you have a wide forehead and a narrow chin, the brim of a hat can help balance a wider forehead. If you go too wide, your chin will appear even more narrow. Avoid: Avoid hats with brims that are small because they will make your forehead look bigger. Avoid wide brimmed hats or hats that are too full as these will make your chin look more narrow. Description: Your face is about as wide as it is long. You have a strong, square jawline and a square hairline. Best Choices: Wear your brims on an angle whenever possible. Wide brimmed hats with a rounded crown can help soften a wider square jawline. Choose hats that sit high on your forehead to elongate the bottom half of your face. Feminine hats with curvy lines will help soften the lines of your face. Round and asymmetrical hats will contrast a sharp jawline. Avoid: Hats with a flat top or a tapered crown. Description:Your face is the widest at the cheekbones, with a narrow forehead. Your forehead and jaw line are approximately equal in width. Your shape is a cross between a heart andan oval. Best Choices: Almost everything works with your balanced face shape. Try a variety of styles. Avoid: You can wear almost anything. Description: Your face is longer than it is wide. It is about the same width at the forehead and just below the cheekbones. Individuals with oblong shapes may have a very narrow chin or a very high forehead. Your face appears long and slender. Best Choices: Choose wide hats with short crowns. Hats with wide flat brims or curled/floppy brims work well. Try pulling the brim of your hat down to your eyebrows to shorten your face. Avoid: Narrow brims and hats with high crowns, which will make your face look even longer. Description: Your face is characterized by a narrow forehead and is widest at the jaw, with a round chin. Best Choices: The best styles will create width at your forehead and temples, giving the illusion of an oval face. They will draw attention to the upper part of your face. Choose hats with a full (but not tapered) crown and a wide brim. Avoid: Hats with tapered crowns, which tend to accentuate a wide jaw. © 2000-2016, Headcovers Unlimited, Inc., All Rights Reserved.